The ModClass was designed as an alternative to the ubiquitous portable trailer that has been a familiar sight on school grounds for decades. It was created to provide a solution to the problem that schools routinely face in needing additional classroom space for fluctuating student populations. This was the issue faced by Halifax Independent School for the upcoming 2014/2015 school year. The ModClass embodies the concept that architecture can improve a student’s learning environment. 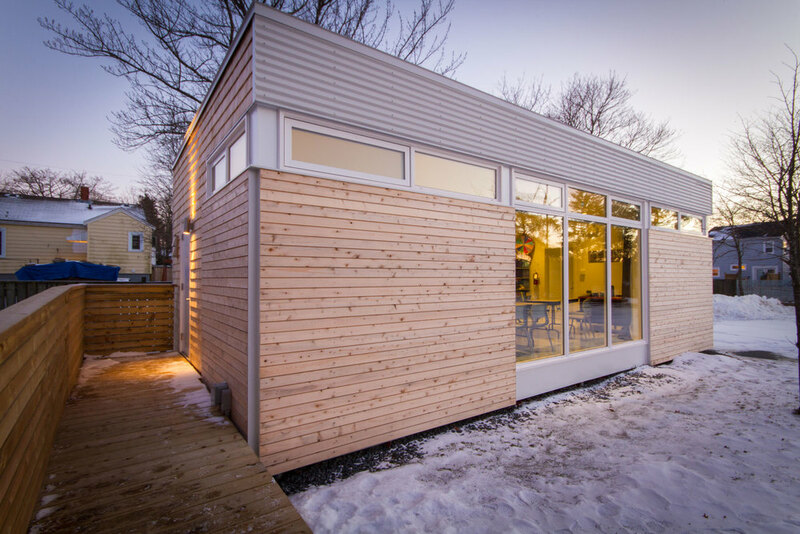 In direct contrast to the standard portable classroom, natural light, energy efficiency, durability and aesthetics were all key tenets of the design. Although it appears relatively permanent on site, the ModClass was designed so that it can potentially be moved in the future by working within the size constraints necessary for transportation. The ModClass was built in six weeks during the school summer break and is a world apart from the cramped and stuffy feeling of the typical portable classroom. The many operable clerestory windows maximize daylight and natural ventilation in the classroom while freeing up much needed wall space. The exterior of the ModClass is clad in a durable, natural, low-maintenance rainscreen consisting of Vaproshield, Ventgrid, white cedar and white galvalume. Ten foot ceiling heights with pot lights provide a sense of spaciousness and the building is insulated with spray foam to ensure energy efficiency. The school used the classroom itself as a learning tool by providing students the opportunity to help with construction. In addition to being a portable classroom, the structure lends itself to many other uses and adaptations.